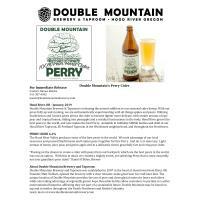 Double Mountain Brewery & Taproom is releasing the newest addition to our seasonal cider lineup. With our press fully up and running, we are enthusiastically experimenting with all things apples and pears. Utilizing Starkrimson and Comice pears allows the cider to become lighter more delicate, with tender aromas of ripe pear and tropical lemon, sliding into pineapple and a residual lusciousness in the body. Hood River grows the best pears in the world, and now makes the best Perry. Available in refillable 500ML bottles and draft at our Hood River Taproom, SE Portland Taproom in the Woodstock neighborhood, and throughout the Northwest. The Hood River Valley produces some of the best pears in the world. We took advantage of our local resources and pressed Starkrimson and Comice pears together for this Perry. And oh, is it sheer joy. Light aromas of honey, juicy pear, and green apple end in a delicately sweet, gracefully tart and crisp pear cider.